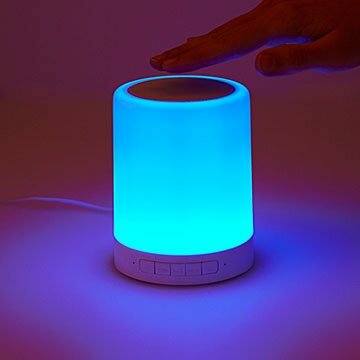 Match the mood of your favorite tunes with this speaker that changes colors. Ever wish you could listen to Dylan's "Tangled Up in Blue" in the cast of blue light? Or for your "Happy Day" playlist, a hue of sunny yellow? This speaker lets you choose the color to match the mood of your favorite tunes. With a light tap, the room is filled with bright pigment and a crescendo of sound, boosting the sensory experience. Keep the chroma consistent, set it on a rotating glow, or increase the speed to create a modern "disco ball" effect. The design includes a collapsible handle for easy transporting or—when it's party time—hanging from the ceiling. Made in China. "WOW, this is so DOPE!" Apparently - the whole family was present when my niece received and opened this package. My brother and his wife were dying to know where I found it. He told me it was a total home run gift. Little gadget - high quality sound; we love to listen to music everywhere and sometimes our phones speakers aren't quite enough. This will be ideal when we are traveling want some tunes in hotel. Great for gift or persona use. I will definitely repurchase.